Available homes across the Bay Area were even harder to come by this May than they were last spring, with the months’ supply of inventory (MSI) dropping from one year ago in all of Pacific Union’s regions except Lake Tahoe/Truckee. Consequently, prices reached yearly peaks in Contra Costa, San Francisco, and Sonoma counties, and they matched one-year highs in Marin County. 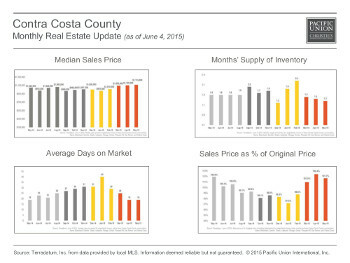 May’s median sales price in Contra Costa County climbed just $15,000 from April, but that was enough to help it reach a yearly peak of $1,115,000. The MSI has been inching down in the region this spring and landed at 1.3 in May, its lowest level since December. The average home sold in a brisk 19 days – unchanged from April and tying a yearly low – while sellers got 101.7 percent of original price. Sellers in the East Bay continued to enjoy big premiums, with the average property selling for 115 percent of asking price for the third straight month. The median sales price cooled almost imperceptibly, landing at $920,000. Housing supply was slim in the East Bay in May, and properties that were available sold fast; the 0.9 MSI was the lowest since December, and homes left the market in 18 days on average. At $1,175,000, the median home sales price in Marin County was unchanged from April, matching its yearly high. Supply increased a hair from the previous month, but with an MSI of 1.3, the market still strongly favors sellers. Homes sold in an average of 55 days, about the same sales pace observed last May. Buyers got a bit of a break, paying 94.7 percent of original price, the least since December. May 2015 looked almost exactly like May 2014 in Napa County if judged on the numbers alone. The median sales price in Napa County dipped to $575,000 in May, landing exactly where it was one year ago. The sales-to-list-price ratio was also identical to last May, with buyers paying 95.4 percent of original price. And homes sold in an average of 71 days, the precise amount of time as last May. The only statistic that differed on an annual basis was the MSI, which at 2.8 is substantially lower than it was in May 2014. The median sales price for a single-family home in San Francisco has been steadily climbing since January and reached another peak in May at $1,400,000. Homes in the city have also been selling at an ever-quickening pace since the beginning of the year and left the market in an average of 24 days. San Francisco sellers continue to pull in premiums and got 110 percent of original price. At 1.4, the MSI was in the same general range as the previous month and one year ago. As with single-family homes, the median sales price for a San Francisco condominium climbed to a one-year high, reaching $1,167,500. Sellers of condos also took in almost identical premiums as their single-family-home counterparts, with the average property selling for 110.4 percent of asking price. Just as in the previous two months, the MSI remained constricted at 1.2. Condos sold in an average of 31 days, consistent with the market’s pace this spring. The median sales price in Silicon Valley has been inching down each month since February, but at $2,625,000 it remains Pacific Union’s most expensive region. Houses have been selling for more than original price for most of the year, and in May sellers received an average of 104 percent of original price . Inventory has been declining since January and hit a one-year low in May, with the MSI falling to 1.1. Homes sold in 21 days, similar to the pace recorded last month and one year ago. Along with the East Bay, the Mid-Penisula had the lowest inventory of any of our markets in May, as the MSI crept down to 0.9. This was also Pacific Union’s fastest-moving market, with buyers taking just 14 days to purchase the average property. Although the median sales price dropped on both a monthly and annual basis to $1,400,000, homes were still in high demand, with sellers taking home almost 111 percent of asking price. The median sales price in Sonoma County has been gradually rising since January and reached a one-year peak in May: $546,000. At 1.7, the MSI was unchanged from the previous month. Properties sold in an average of 64 days and for 97 percent of original price – generally consistent with levels recorded over the previous two months. Sonoma Valley’s median sales price took a sizable dip from April to finish May at $650,000, but it is still up about 20 percent on a year-over-year basis. The supply of homes has been shrinking every month thus far in 2015 and finished May at 1.8. Properties sold in 51 days, the fastest clip since May 2014. Buyers paid 95.5 percent of original price, less than they did last month or one year ago. At $536,000, the median sales price for a single-family home in our Lake Tahoe/Truckee region was almost identical to April’s number. Buyers had a bit more room to negotiate than in the past two months, paying an average of 91.5 percent of asking price. Homes took an average of 82 days to leave the market – the quickest pace since last fall – while the MSI expanded to 7.6. Condos in the area have been selling quicker than in the previous month since March and took an average of 73 days to sell in May. Buyers paid 94.1 percent of original price, nearly identical to statistics from the preceding two months.